How was your Christmas? We really enjoyed ours. It was so nice spending time with my husband and boys, it was simple and turkey and fixings at my in-laws on Christmas Day was delicious, as always. We are determined to have a good time, my husband has a few days off so we are doing what we never get to do. Nothing. It's always rushing to do this or that, but we all kind of got sick, so either way, we had to take it slow. And I am very grateful for it. It means lots of hot tea and cocoa, lots of Santa movies (mostly bad :D), lying on the couch and taking turns pampering each other, depending who feels the least sick at the moment. Usually it's Chris, because he is invincible. He still says he isn't sick. He is good at denial too, haha. All joking on the side, we are home together, warm and well fed, we shared some beautiful gifts, yummy foods, many laughs and some amazing memories have been made, the only thing in the world that would have made it the most amazing Christmas ever is if my family from Croatia could have been here to celebrate it with us. Speaking of my family, my dad loves to make Arancini. He makes it, his mom made it and her mom probably too. There might be some confusion if I called these Arancini though, since there is a few other edible things with the same name, here the most popular being Sicilian fried rice balls, so lets just call these candied orange peels. Sometimes things just get too confusing without compromising a bit. Call them what you want,. but they are amazing. 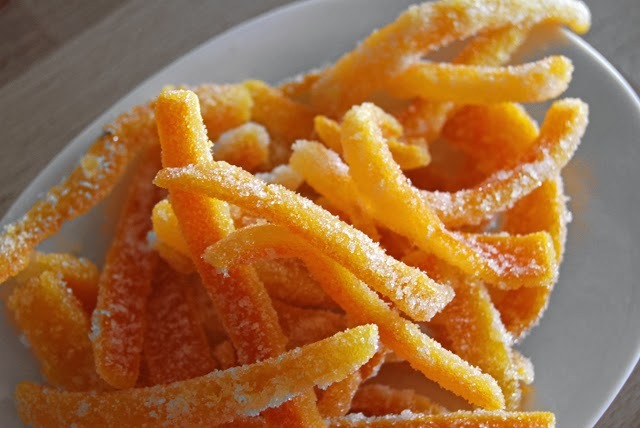 I've tried candied lemon peels which I love, and I still want o try making candied grapefruit peel, but I think oranges are the best to use. Sometimes I have time and desire to dip them in the chocolate, but most often we have them just like this, they are really delicious. Wash the oranges well. Cut the top and bottom of each orange, score the peel of the orange from top to bottom with a knife every few inches and then remove the peel. 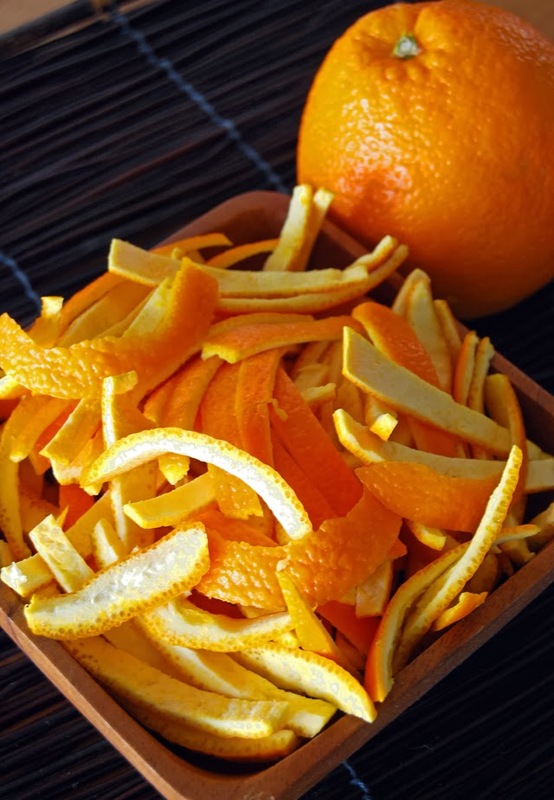 With a knife, remove all the bitter white skin from the back of the orange and then cut the peel lengthwise into strips like pictures bellow. 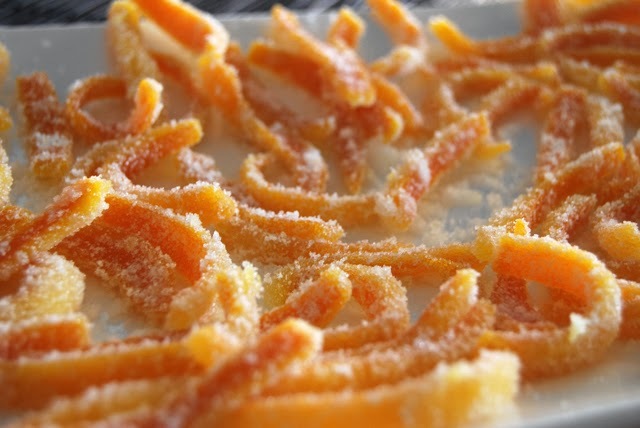 Put the orange peel strips into a bowl of water for about 2 hours before boiling it in sugar syrup. Put the sugar and water into the pot and on medium heat, cook until sugar is completely melted. Add the peels and cook for about 30 minutes, until peels are tender. If you are making them for the first time, I advise you to take one out at that time, let it cool for a minute and try if you like the texture. My dad likes cooking them longer, but about 30 minutes works best for me. Some people cook them even shorter! Once the peel is cooked long enough, take it out of the orange syrup, drain well and roll into sugar before arranging it on a baking sheet to dry. When cooled a little you can dip them into melted chocolate, or you can skip rolling them in the sugar and dip them into chocolate right after cooking and let dry. It's all about what you like the best. This is a simple and delicious dessert and nicely packaged in a mason jar or a cute box makes an amazing gift for a hostess or a neighbor during the holidays.